Have you ever had a problem with transporting liquid in your vehicle? Ever spilt coffee in your car and had to put up with wet seats, leather stains or the stench of week-old coffee? I’ve certainly had these problems before but hopefully that will all change due to a convenient discovery I made this weekend. Sunday I had to bring coffee and donuts to an event for 20 people. Because I’m not hugely creative when it comes to food, I immediately narrowed my list of options to one vendor: Dunkin Donuts. But I’ve never been very lucky with transporting liquid in cars and, as such, I was concerned that there would be a lot of spillage. This would, of course, translate into a big clean up job and more work for me. It is for this reason that I was extremely pleased when I pulled up to the drive through window and the Dunkin Donuts employee handed me a “box o’ Joe” coffee box. Perhaps, the best thing about the box o’ Joe is that its cubic shape affords more stability than most containers. It rests securely and comfortably on any car seat. The weight of the coffee is distributed evenly across the box, ensuring that the box remains stable rather than rolling around and spilling its contents. Another important affordance is the handle, which clues the user in on the appropriate way of holding the box and laying it down on his or her car seat. 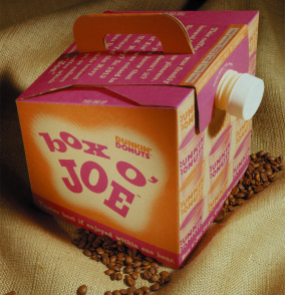 Once the user has arrived at his or her destination and is ready to consume the coffee, the box o’ Joe continues to be worthy of Hall of Fame status. The box has a visible shape that mimics the traditional coffee-pot or tea-pot shape, allowing for quick perception of the method in which the box should be used. In addition to the already mentioned handle, the white capped nozzle acts as a pseudo-spout. These design functions allow for more ease of use—mapping out the relationship between the controls (handle and spout) and their action (pouring the coffee). The only criticism of of the box o” Joe is the use of the box at the end. Initially, when the box is full of coffee, liquid flows out steadily and the user can visually gauge how much coffee is being poured out. However, as the liquid dwindles the user must lift the box higher and higher in the air until the width of the box actually blocks the view of the cup into which the coffee is being poured. This can result in too little or too much coffee being poured. Nevertheless, box o’ Joe coffee is on the whole a great product that ought to be replicated in other similar restaurants. Great job Dunkin Donuts.